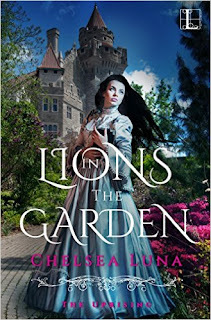 Chelsea Luna: Lions in the Garden on SALE!!! Lions in the Garden on SALE!!! Lions in the Garden (Book 1, The Uprising Series) is on sale for the #Nook - Click here to download for $0.99! Ludmila Novakova--Mila--has barely set foot outside Prague Castle in her seventeen years. But with the choice between braving the bandits and wolves of Bohemia's uneasy roads or being married off to a disgusting old baron, she's taken what she can carry and fled. Escape won't be easy. Even Mila has heard the rumors of a rebellion coming against the court. The peasants are hungry. The king hasn't been seen in months. Mila's father, the High Chancellor, is well known and well hated. But Mila can't sit behind a stone wall and let fear force her into a life of silk gowns and certain misery. Her mother's death has taught her that much. She has one ally: Marc, the son of the blacksmith. A commoner, a Protestant--and perhaps a traitor, too. But the farther she gets from the castle, the more lies she uncovers, unraveling everything she thought she knew. And the harder it is to tell friend from enemy--and wrong from right . . . This post is spot on in enlightening how some ethics affect to any writing position.